This fairy tale retelling lives in a mystical world inspired by the Far East, where the Dragon Lord and the Serpent God battle for control of the earthly realm; it is here that the flawed heroine of Forest of a Thousand Lanterns finally meets her match. An epic fantasy finale to that breathtaking and dazzling story. Princess Jade has grown up in exile, hidden away in a monastery while her stepmother, the ruthless Xifeng, rules as Empress of Feng Lu. But the empire is in distress and its people are sinking into poverty and despair. Even though Jade doesn't want the crown, she knows she is the only one who can dethrone the Empress and set the world right. Ready to reclaim her place as rightful heir, Jade embarks on a quest to raise the Dragon Lords and defeat Xifeng and the Serpent God once and for all. But will the same darkness that took Xifeng take Jade, too? Or will she find the strength within to save herself, her friends, and her empire? 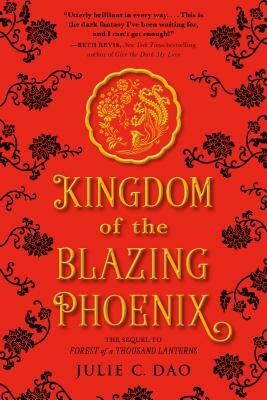 Set in an East Asian-inspired fantasy world filled with breathtaking pain and beauty, Kingdom of the Blazing Phoenix is filled with dazzling magic, powerful prose, and characters readers won't soon forget. Fans of Stealing Snow, Red Queen, and The Wrath and the Dawn will hungrily devour this page-turning read. Julie Dao (www.juledao.com) is a proud Vietnamese American who was born in upstate New York. She studied medicine in college, but came to realize blood and needles were her Kryptonite. By day, she worked in science news and research; by night, she wrote books about heroines unafraid to fight for their dreams, which inspired her to follow her passion of becoming a published author. Her debut book was Forest of a Thousand Lanterns. Julie lives in New England. Follow her on Twitter @jules_writes.